TestScribe is a tool designed to export various sections of a Visual Studio 2012 test effort to a Word document. Added support for showing test run summary for customized test result fields. Added support for showing the Test Scribe generated reports in Word 2013. Fixed some issues related to reporting test results marked as ‘Not applicable’. Fixed issues related to opening test run summary for the 1st time. 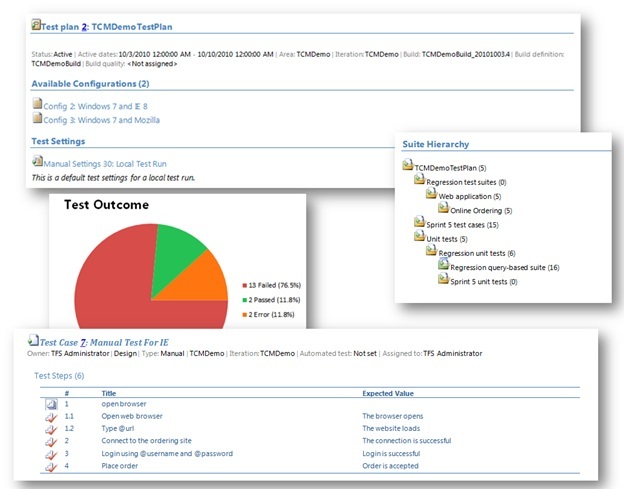 Fixed issues related to opening test run summary from a VS Update 2 client and TFS 2012 setup. In case of TFS 2010 test cases having "<", ">" in test steps and upgraded to TFS 2012, the test steps formatting gets corrupted. Test Scribe fails to generate a valid document for plans having such test cases.To fix the issue, this tool can be used. Once the corrupt test cases are fixed, Test Scribe works fine. If you try to generate a test plan document when the number of test cases in a suite is more than 1500, an exception is thrown. Generated documents are stored by default in the “My documents” folder. The output path of the generated report cannot be modified. Exporting word documents for individual test suites or test cases in a test plan is not supported.